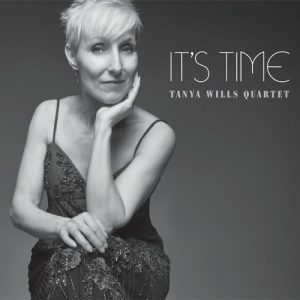 The agility with which Tanya Wills can – and does – sing is absolutely astounding. This is almost immediately in evidence as after she opens It’s Time with a swinging, feisty version of “All Shook Up”, displaying her marvellous mezzo, she soars in a manner that is almost unimaginable immediately thereafter on “Lazy Afternoon”, a song in which she also swoops down low beneath the trills of Bill Bridges’ beautifully plucked guitar accompaniment. After that song there’s absolutely no stopping her as she launches into “Chicken Mamas” and things take off. The recording is a very special one, featuring beautifully crafted arrangements of beguiling variety and sensuousness, in every lovingly crafted phrase of every song. Moreover Miss Wills seems to enjoy a very special empathy with her guitarist, Mr Bridges and whenever they exchange choruses and soli both shine brightly. Miss Wills’ chosen material, with one or two notable exceptions, judiciously focuses on some lesser-known gems associated with ladies who fronted celebrated big bands. Listening to the way in which Miss Wills seductively bends the notes in “Cry Me a River”, and how she sculpts the long, sustained invention of “When Sunny Gets Blue”, it’s clear that there’s not a single semi-quaver that hasn’t been fastidiously considered. Featuring not only brilliant work by Mr Bridges, It’s Time also highlights the special skills of pianist Jordan Klapman and contrabassist Ron Johnston who, together with Mr Bridges, are both attuned to Miss Wills’ vision and artistry. This is a glossy recording with many solid virtues both from the vocalist and the other musicians who seem in step with each other at all times. The repertoire – from “Honeysuckle Rose” to “If I Were a Bell”, “Nice Work if you can Get It” and more – is also a perfect fit for the strengths of Miss Wills. It’s clear also that Miss Wills is capable of a flawless performance no matter what the chart because she also works her subtle re-inventions of phrasing and articulation into the material right down to the surprise ending. As a result she produces something joyful and to die for as well.